FIGURE 2 Schematic diagram of a cross section through the wall of a continuous-, fenestrated-, and discontinuous-type capillary. 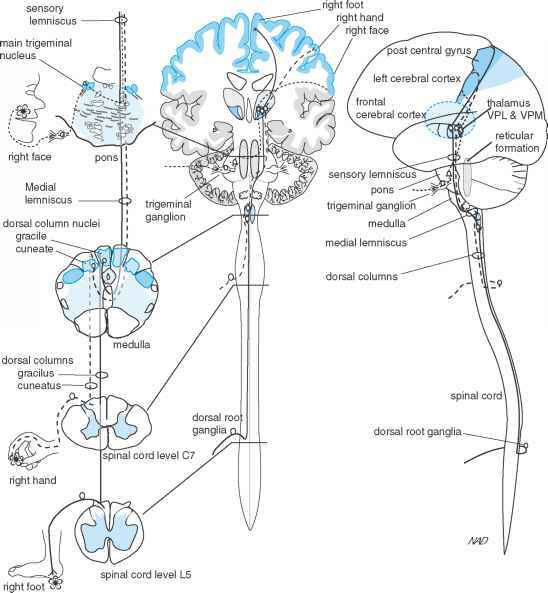 The following routes of transcapillary exchange are noted: BM, basement membrane; ICJ, intercellular junction; V, vesicles; OF, open fenestrae; DF, diaphragmmed fenestrae; G, gap. A potentially important route for transfer of plasma proteins between blood and the interstitial compartment is the micropinocytotic vesicle. Plasma proteins are thought to cross the capillary wall by endocytosis at the luminal surface, vesicular transport through the cytoplasm, and exocytosis at the interstitial side of the endothelial cell. Fenestrated capillaries (Fig. 2b) are about 10 times more permeable to water and small (hydrophilic) solutes than most continuous capillaries. The unique structural feature that accounts for the increased permeability of these microvessels is the perforations (fenestrae) in the endothelium with diameters between 500 and 600 A. The fenestrae are mostly open holes, but in some vascular beds (intestine) the endothelial perforations are bridged by a thin membrane or diaphragm, which can offer significant restriction to the passage of plasma proteins. The existence of these diaphragms accounts for the fact that fenestrated capillaries appear to be as equally impermeable to plasma proteins as are many continuous-type capillaries, but they are far more permeable to water. Hence, it is not surprising that fenestrated capillaries are found in tissues specializing in fluid exchange (renal glomeruli, exocrine glands, intestinal mucosa, choroid plexus). In discontinuous (sinusoidal) capillaries (Fig. 2c), adjacent endothelial cells do not meet to form clefts at all. As a consequence, intercellular gaps as large as 1000-10,000 A are formed. These capillaries are highly permeable to water and plasma proteins. They are found in organs in which red blood cells are often seen to migrate between blood and tissue, that is, spleen, bone marrow, and liver. Anatomic and physiologic studies indicate that there is an increasing capacity for water and solute exchange across endothelial cells from the arterioles to the postcapillary venules. This axial gradient in vascular permeability in continuous and fenestrated capillaries can be explained by larger cleft widths on the venous end of capillaries and in small venules, compared with arterial segments of the capillary. In fenestrated capillaries, the density of fenestrae that pierce the endothe-lium also increases in frequency from arterial to venous ends of the capillary. A consequence of the axial differences in exchange pathway dimensions and frequency is the tendency to lose more plasma proteins from the venous side of the microcirculation, both under normal conditions and in pathologic states accompanied by increased protein extravasation (e.g., inflammation). The principal mechanism responsible for the movement of small solutes between the blood and interstitium is simple diffusion down chemical activity gradients. Dissolved gases and small lipophilic molecules can rapidly diffuse across the entire endothelial cell membrane, with the rates of exchange within a tissue governed primarily by their respective concentration gradients and the number of capillaries that are perfused and thus open for exchange. Although small hydrophilic solutes like glucose and amino acids largely cross the capillary wall through a more restricted area of the capillary wall, that is, the interendothelial clefts, their rates of diffusion are extremely rapid, reaching an equilibrium across the capillary wall within a fraction of a second. Another mechanism that contributes to transcapillary solute exchange is convection or bulk flow. This process represents the transfer of dissolved solutes across a membrane via the movement of its solvent, for example, filtered plasma. As the fluid filtration rate across the capillaries increases, so does the convective transfer of solutes dissolved in plasma. The diffusional exchange of small solutes across the capillaries is much faster than that which can be achieved by convection; however, the latter process contributes significantly to the movement of plasma proteins from blood to interstitium. In some tissues (e.g., intestine) convection accounts for almost half of the plasma protein extravasation observed under normal conditions and essentially all of the protein exchange that occurs in conditions associated with a very high capillary fluid filtration rate. The rate of efflux of plasma proteins from the capillaries can also be profoundly influenced by the electrostatic charges of the protein and the interendo-thelial cleft. Albumin is a negatively charged plasma protein that appears to permeate capillaries at a rate that is 1/100 the rate observed for hemoglobin, a protein of nearly identical molecular size to albumin but which is almost electrostatically neutral. Physiologic studies in organs such as the kidney and lung have revealed that the capillaries in these tissues behave like a negatively charged filter, that is, they retard the transport of negatively charged plasma proteins while enhancing the exchange of positively charged proteins. Hence, it is generally assumed that the fixed negative charges associated with mucopolysaccharides found on the endothelial cell surface and in interendothelial clefts normally serve to minimize the loss of proteins from the blood. Pathologic conditions that result in the loss of these negative surface charges on capillaries, such as glomerular capillaries in patients with nephrotic syndrome, are characterized by excessive protein loss and interstitial edema. The exchange of solutes across capillaries is a very dynamic process, with large fluctuations often occurring in association with accelerated organ function (e.g., in skeletal muscle during exercise and in intestine after ingestion of a meal) and with organ dysfunction (e.g., liver cirrhosis). Two structural elements of the microcirculation represent major centers of control over the magnitude of solute exchange in a vascular bed: the precapillary sphincter and the endothelial cell junctions. By virtue of its ability to determine the number of perfused capillaries (and the surface area available for exchange) at any given moment, the precapillary sphincter can govern the overall flux of solutes from blood into the interstitium, and vice versa, within an organ. Contraction of the sphincters will reduce the surface area for exchange and thereby limit overall solute (and water) transfer, whereas dilation of the sphincter will increase the number of perfused capillaries and enhance overall solute transfer. The contractile state of the endothelial cell can also exert a profound influence on the rate of solute (and water) exchange across a vascular bed. Endothelial cells possess the capacity to contract through a process that involves rearrangement of cytoskeletal elements such as F-actin and myosin. When endothelial cells do contract in response to a physiologic stimulus, this results in an opening of the cleft between adjacent cells, with a consequent increase in capillary permeability. Bradyki-nin and histamine are examples of endogenous inflammatory agents that can interact with their receptors on endothelial cells and subsequently cause cell contraction and an increased transfer of solutes across the micro-vasculature. These agents and many others appear to exert their permeability-increasing effects predominantly on the venous side of the capillary and on small venules, suggesting that the density of their receptors is greater on endothelial cells in this segment of the microcirculation.